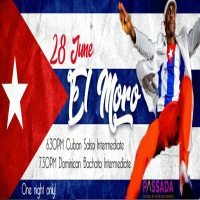 AN EVENING WITH MORO – Cuban Salsa & Dominican Bachata workshops – ONE night only! For one night only, world renowned Cuban dancer, teacher & Director of Sydney’s Buena Vista Cuban Dance Academy, Airagdin Pavon More (“El Moro”) is taking over the Havana Room for 2 special workshops: Cuban salsa AND Dominican bachata. Ref: In the reference field, please enter your name and if you are attending only 1 workshop, please specify either "salsa" or "bachata"